As I sat down to write about the Dublin artist Fergus Kelly’s gripping release from 2012, A Congregation of Vapours, word came across a news feed that Jack Vance died two days ago. Vance is the author of the Dying Earth fiction quartet, four novels spanning 1950 to 1984 (a long, attenuated death, with a long-held fatalistic tone, and characters enduring a bleak Earth under an exhausted sun). This was an apposite event at the edges of writing about Kelly’s work (I am not being heartless, Vance was 96, outliving his cosmos), as today I settled on the title above. That Hideous Strength is, of course, the title of the third, dystopian novel in C.S. Lewis’ allegorical space trilogy, a favorite of mine from many years ago. It attached itself to my many listens through A Congregation of Vapours, as I sensed in Kelly’s whorling salmagundi of aspirations and gasping, enervated storms, a pulled-down heaven. I then reluctantly visited Kelly’s blog, A Sullen Relapse, where he very occasionally posts about his working process – reluctantly, as I try to avoid such details from the musicians I am writing about until I have finished writing. 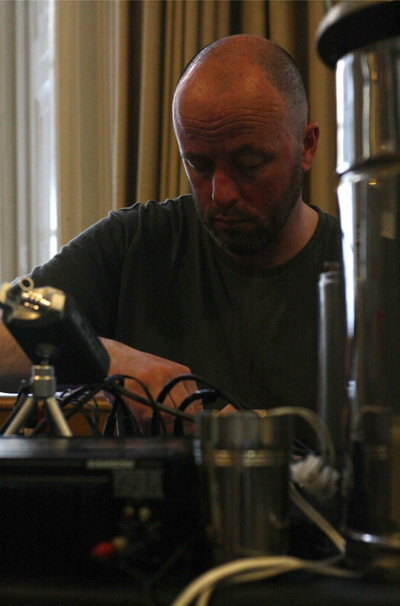 Amidst Kelly’s descriptions of the elements used to create A Congegation of Vapours – the meticulous stitchery of no-input mixing board, tape, homemade instruments, and location recordings – there is an interview in which he refers to Hamlet’s stake-in-the-heart speech from which he derived his piece’s title. Hamlet offers in a pith four-line trajectory his sojourn from good-natured lad to dystopian Prince – this most excellent canopy the air, look you, this brave o’erhanging firmament, this Majesticall roofe, fretted with golden fire: why, it appeares no other thing to me, than a foul and pestilent congregation of vapours. Deep heaven is pulled down, and Kelly’s alternately seething and subsiding sound work is the soundtrack. So dystopias align today – along Vance, Lewis and Shakespeare’s references to firmaments that are insubstantial enough to collapse on our heads, vaporous and burnt out – and in Kelly’s sonic swither of unstable emanations, in his raw and rough structures whose clarity and brilliance are only gradually apparent Kelly’s blog post will fill out the specifics of his painstaking working process, but I suggest two things – obtain a copy of this remarkable work, and live with it awhile before reading how it was made. The experience of immersion in a work that does not readily reveal its elements is rare enough – one met bees in the garden, but never found a bee hive – Kelly is reminiscent of Joe Colley in delivering the visceral goods with that sort of ambiguity and unease. Heaven has folded like a cheap suit, we might as well enjoy the music. This entry was posted in music writing on May 30, 2013 by jessewgoin.